This unique one and three-quarter-acre vineyard is actually on Sonoma Mountain but carries the Sonoma Coast appellation. Frequent fog drifts in from the ocean forming a billowy blanket about 50 feet below the vineyard fence. The Clouds Rest Vineyard is situated at 1250 feet and is the most intensely planted vineyard in the Sonoma Coast AVA, and may be the most difficult and expensive to farm. The vines are planted 3 ft x 3 ft (an arm’s length apart) in volcanic soils and farmed completely by hand. The planted clones are Pommard 3 and 115, 667, and 777. 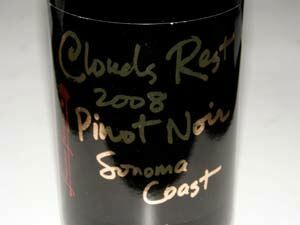 The Clouds Rest Pinot Noirs are aged for 18 months in 50% new French oak and bottle aged an additional 18 months to 3 years. The noted winemaker since the first vintage in 2002 is Anthony Austin. The single vineyard-designate Pinot Noir is sold on the website. The principals are Scott Schuette and John Saemann. 707-765-0841.